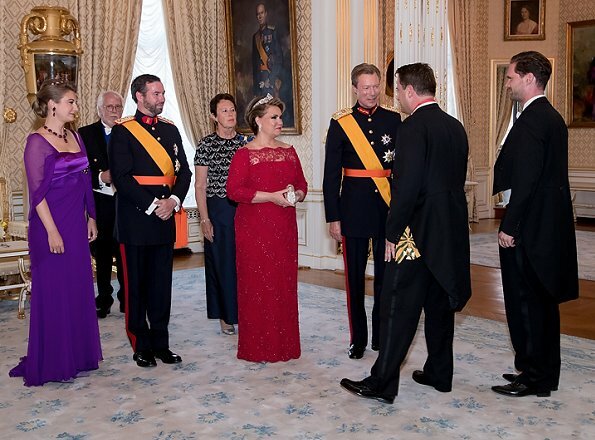 After celebrations of National Day of Luxembourg that took place on Friday, in the evening, Grand Duke Henry, Grand Duchess Maria Teresa, Hereditary Grand Duke Guillaume and Hereditary Grand Duchess Stéphanie held a official reception at the Grand Ducal Palace in Luxembourg. Very lovely. Stephanie has stepped up her game and looks very regal. 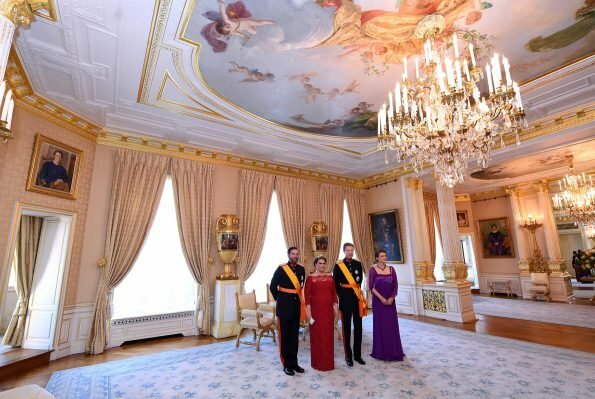 The Grand Duchess looks elegant as usual. I just noticed, that Stephanie's outfit is her Mother in Law's dress. Maria Teresa wore it in April 2008 on a visit to Sweden. These two women look "Absolutely Fabulous!" The jewel tones of the dresses are lovely and their accompanying jewels match perfectly. My only small criticism is that the eye makeup on the Grand Duchess is a little too heavy. To give them credit, the men also look very nice. All four have perfect posture in each photo. I think M.T. 's clutch does not go well with her dress, otherwise, very nice, and Stephanie, WOW. I love her jewels. A bit too matronly in my eyes. But those jewels, just wow, wow, Wow!! I agree about that dress, very matronly for a young woman. She really looks better lately as to hair and jewels, but needs a more youthful look. That shiny band across her bust is strange. Were they covering up some of the remodeling of the dress? Better to start a new one instead. The jewels are wonderful! Maria Teresa definetivly is a woman one would like to meet personally! From my point of view, Grand Duchess looks fabulous. In contrast, I would have liked the Prince's Stephanie dress to be more simple. I find it too much sophisticated for being elegant. With no doubt they both look very regal to my eyes. That's really a dress with a lot of loose fabric at the front. Maybe Stephanie is finally pregnant now? That would be a huge happiness! Otherwise, I think it's a little weird design. Both Marie Theresa and Stephanie look very good. Jewels are awesome. 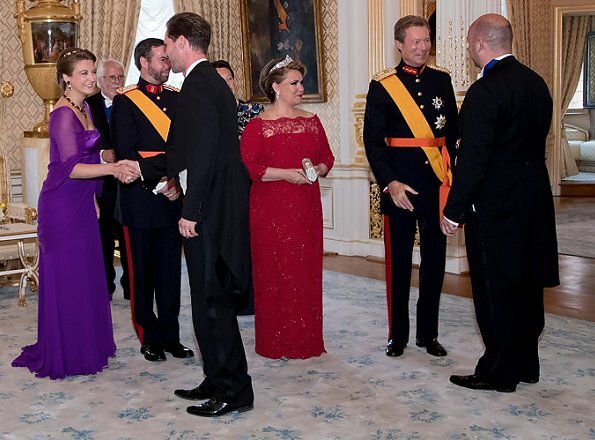 The purple dress that Stephanie is wearing is the same gown Maria Teresa wore back in 2008 (read it in another article). 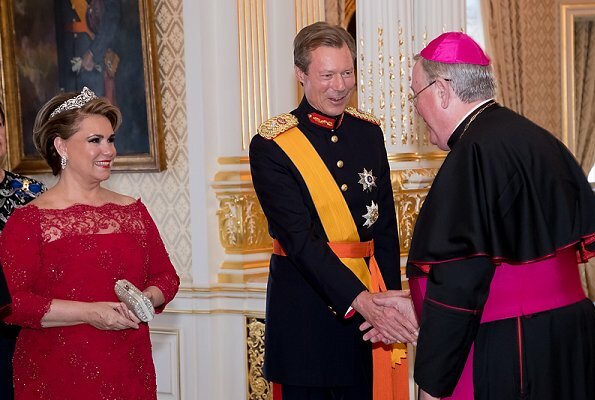 I am not sure about Stephanie's choice of wearing one of Maria Teresa's dresses for this reception. It looks matronly because it was the initial choice of a matron. 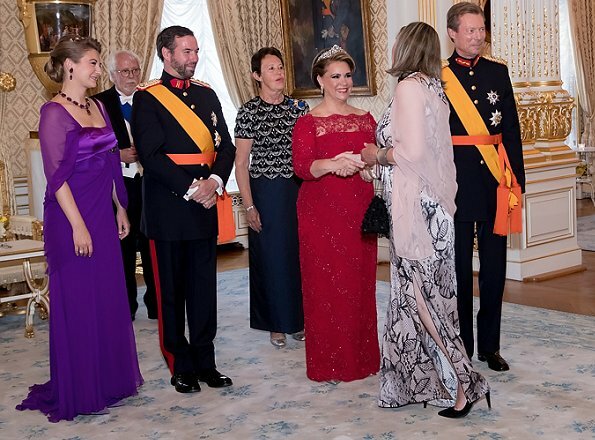 It has clearly been adjusted but it's not always easy to alter a dress satisfactorily from Maria Teresa's size to a slimmer and younger woman. Stephanie doesn't look bad--I love how she has improved her dress style in the last few months--but this was perhaps not the best decision. Personally I would love to have access to Maria Theresa´s clothes, she has masses of very beautiful Elie Saabs etc. Yes, Blondiini: Stephanies's dress is from Maria Teresa (worn in 2008 in Sweden). The colour of the dress of Stephanie is great but she is to young for wearing this dress, the dress is more suitable for women in their 60's or so. Iris, that's what I think! 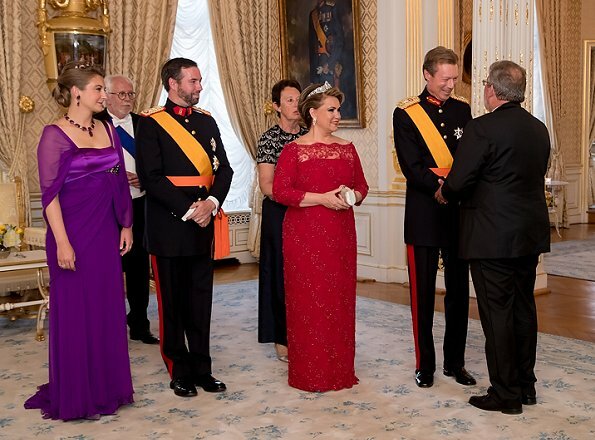 Maria Teresa looks fabulous wearing the Belgian Scroll tiara, to my taste the most beautiful among the medium-sized tiaras in the Luxemburg collection. Her simple hairstyle is perfect to draw the attention to this wonderful piece. 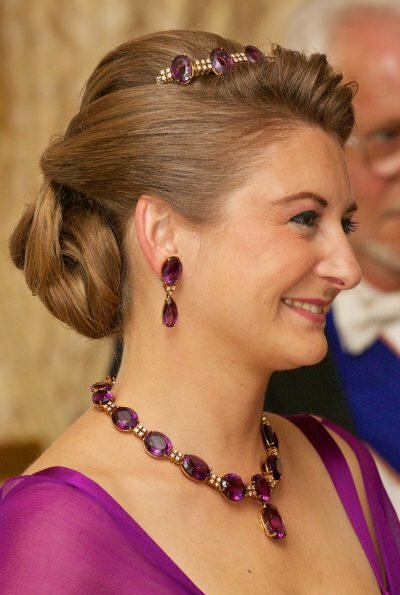 On the contrary, Stephanie's purple dress doesn't allow the pieces from the amethyste parure to stand out. Moreover the dress doesn't look good on her. The girl is young, has a nice figure and surely many other assets, but good taste and the ability to enhance her beauty through becoming clothes is not among them. I think both ladies look good. Love that colour on Stephanie and her jewellery is fabulous. Stephanie's dress is s teeny bit fussy/matronly but I guess she wanted the colour to go with the jewels (which are gorgeous!). A simpler dress in that colour would have been better - but she does look Royal! 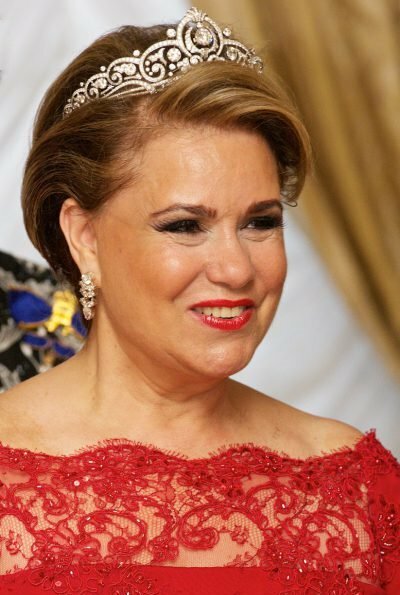 Maria Teresa looks elegant. The dress suits her and is very flattering. 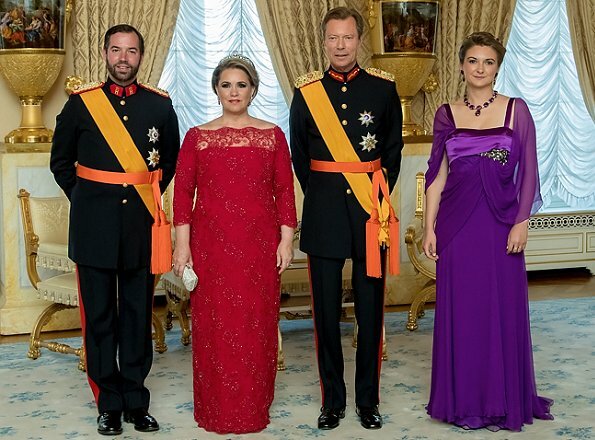 I don´t get the matronly-vibe from Stephanie´s purple gown. I find it very attractive and flattering on her. The only thing that I find odd her is the brooch placement almost right on her bust.